After finally coming up with a new name, logo, and colors for our the rebrand, we wanted to create a sleek, stylish and modern website to tell our story. For small businesses, a helpful and well designed website can be an incredibly valuable asset. We enlisted the help of John Thompson, a talented web developer, to help us design and build out the new site. As a newly rebranded business, we wanted to give our customers insight into to the type of work we do, but more importantly who we are. A huge part of our mission statement is that we care for people. Not just our customers, business partners, and employees, but also people that live in our community. The business was actually started to provide more consistent year round work for our seasonal workers. We also feel that it is imperative to not just provide quality work and customer service but also to treat people the right way and be a valuable asset to the local community we are a part of. Community is one of our three core values and by far the most important. The others are respect and collaboration. At its core, all of these values are related to people and being part of something that is bigger than us. Since who we are is more important than what we do, we thought it was critical to not only use the website as a tool to talk about the value we provide to the community as a business, but also as a opportunity to tell our a customers a little bit more about ourselves and why the business exists. I wrote extensively about or core values and the things we do to help out the community. Holiday Spirit Lighting, our sister business, annually donates money to charitable causes like Susan G. Koman Foundation, Toys for Tots, and Northwest Harvest to mention a few. We also donate free-of-charge holiday light installations to Nyer Urness and El Centro De la Raza. In past years our owner, Brett Farrington, has also volunteered both internationally and also on a weekly basis at El Centro De Laza’s food bank. Businesses are inherently concerned with making money and that’s always in the forefront. However, for us it is equally important to give back and do things that help out others around us. For us, it’s all about people and the community we live in. Apart from wanting to share our story, we also wanted to show our customers and the people who work with us the type of work we do, visually speaking. Visual storytelling is an important tool and can be a very helpful way to create a bond between us and our customers. Sam McNearney, Connor Mack, and Kyle Mealand were our main models for the photoshoot. They are employees for Holiday Spirit Lighting and Sam is the General Manager and Director of Sales for Renova Exterior Detailing. We wanted to show our customers that our guys take their job seriously and do their best to provide a high quality of service. We also wanted to show the tools and equipment we use to get the job done the right way. Finally, some of the shots show our guys in difficult or dangerous situations. The work we do requires us to be in some pretty precarious positions. 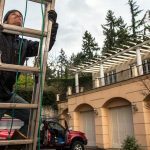 Rest assured, we do use the proper harnesses, ladders, and other safety equipment to ensure that our guys are never put in unnecessarily dangerous situations. We not only care about doing a quality job but we also care about the safety and health of our employees. Like we said earlier, we are more than just a business, we are trying to take care of people and help them too. Another important component of our website is that we wanted it to be user friendly and also for it to be easy for customers to find what they are looking for. I’ve done a bit of UX Design in the past, so this was a nice chance to focus on information architecture. Simply put this means how you choose to categorize and store information on your website or on an app. Good information architecture requires being logical and thinking about things from the perspective of your customers. Basically thinking about what their goals are when they visit the website, what type of information they are looking, and finding a way to group things in a logical way. That way you aren’t forced to spend too much time searching for information and you can get the job done easily and efficiently. I created a site map and grouped categories with other similar categories. On our site navigation (the menu that contains different categories) we wanted it to be relatively straightforward without too many topics. I know it was important to have a nicely designed home page, a section listing our services, an ‘about us’ section to talk about the team and us as individuals, and a way to contact us to get a quote. I also wanted to include an ‘Frequently asked questions’ section to save our customers time and effort with answers to questions they may or may not have thought about. 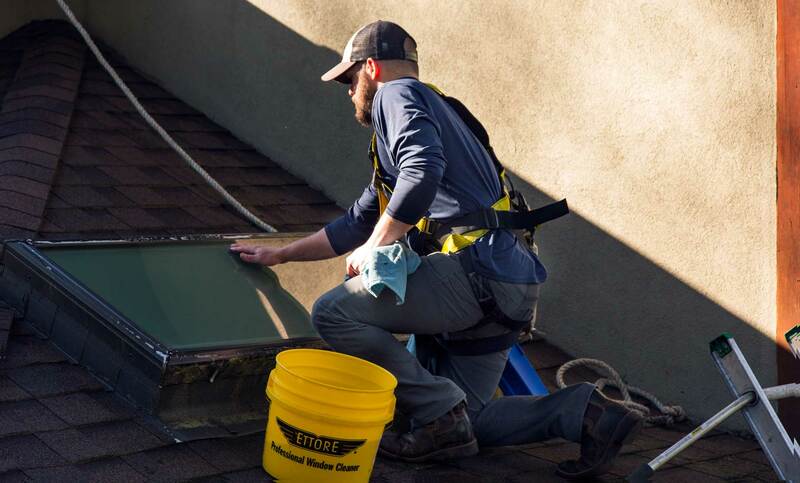 Brett and I also discussed a having the website include a blog to provide information on home maintenance tips, what the business is working on, reasons to maintain your gutters or roof, and other things of that nature. We not only care about our customers but we care about home maintenance and we can provide some quality tips and information to help you have your home looking its very best.